This is a great dish to serve as a starter at a dinner party. It is very simple to make and very easy to serve. 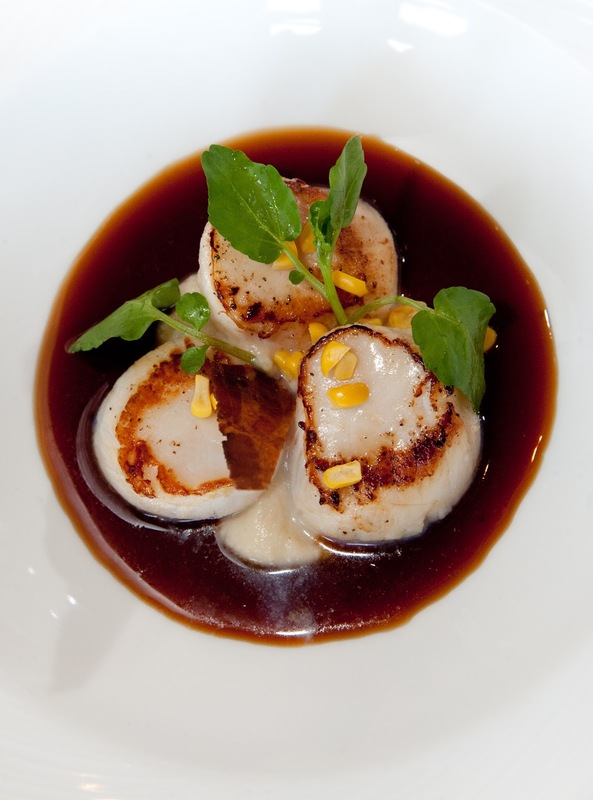 The creamy, sweet taste of the sweetcorn works beautifully with the scallops and the saltiness from the bacon jus pulls the whole dish together. Local scallops are at their very best at this time of year, they may be expensive but they are worth a treat for a special occasion. Place oil in large soup pot, add onion and cook over medium heat until the onions have softened but haven’t taken on any colour, add half the butter, the corn and the thyme, cover and cook over low heat for 15 minutes or until the corn is tender. Remove from the heat and add to a blender, add the rest of the butter and then puree in the blender until very smooth, season to taste and set aside. Place a small pan over high heat and add the olive oil, add the shallots and the pancetta, cook until all is golden brown. Add the beef stock and the chicken stock and bring to the boil. Turn the heat to a simmer and continue to simmer until the sauce has reduced and thickened, season to taste. Heat a frying pan over high heat and add some olive oil. Make sure the scallops are very dry, season well and carefully sit the scallops in the pan. Keep the heat quite high so as the scallops sear, taking on a slight burnt tinge around the edges. Cook for 1min then add a knob of butter. Cook for a further minute and turn and cook for a further1-2mins depending on the size. For best results keep the scallops slightly rare in the centre.